Copyright Notice: Ice Age™ & © 2018 Twentieth Century Fox Film Corporation. All Rights Reserved. These are the official Sid, Scrat and Diego licensed characters, Sid, Scrat and Diego. 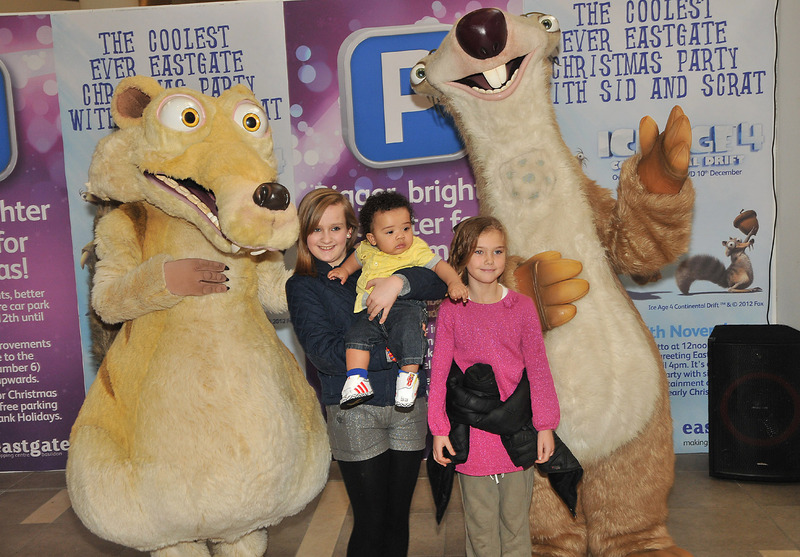 Rainbow Productions holds the UK’s official licence to manage the personal appearances of Sid, Scrat and Diego at public events on behalf of the brand owner. We take care of everything; our full service includes the copyrighted character costume, trained performer and Road Manager (minder) to accompany the character. Please visit our character events page to find out more. Due to the nature of the events we manage, we are not able to supply characters for private children’s parties or similar events. 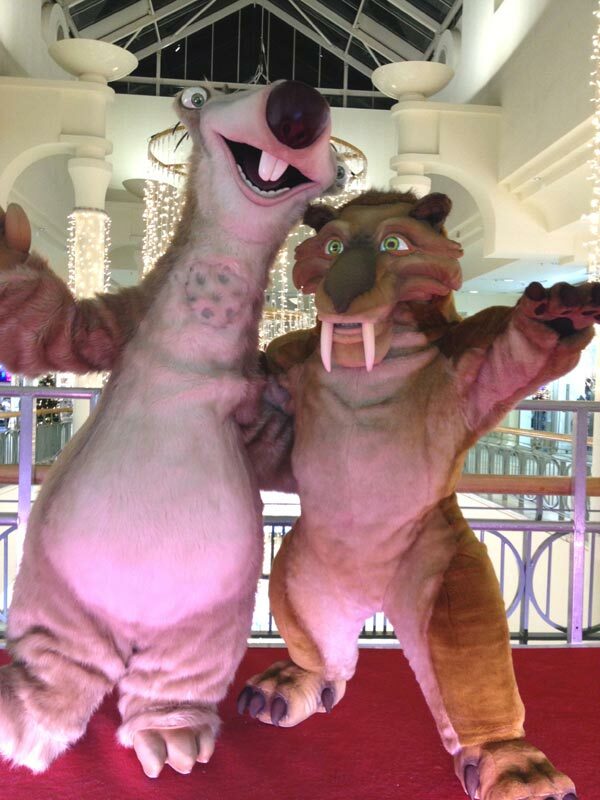 Ice Age is a beloved family franchise that has amassed a global following since the first film was released in 2002; for those who want to make a big impression when hosting a family-focussed event then, hiring Ice Age mascots is a great choice. There have been a total of five Ice Age films released, alongside plenty in the way of merchandise, short films, television specials and original songs. 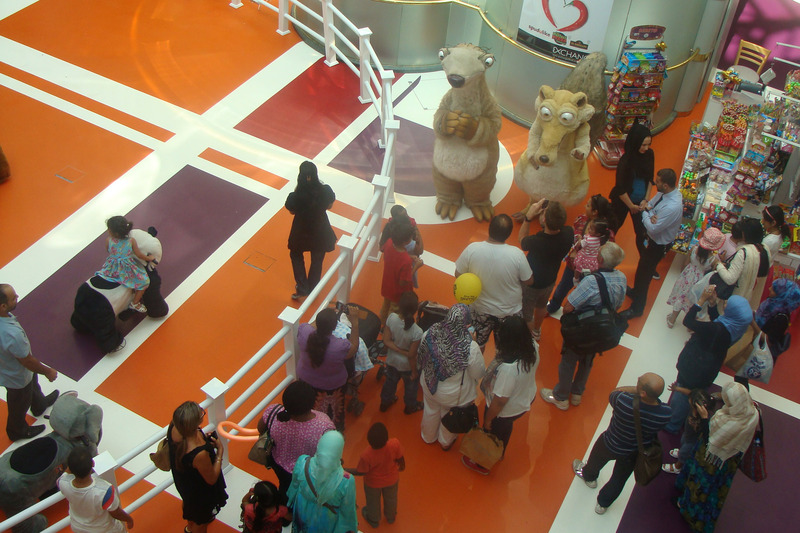 Now, kids can experience getting to see their favourite Ice Age characters up close and in person with our professional mascots. Our actors are available to attend events across the UK in officially licensed costumes for a meet and greet that feels like the real thing. Hire actors in a Sid, Scrat or Diego Costume, and see first hand how much enjoyment little ones can get from meeting their prehistoric heros. 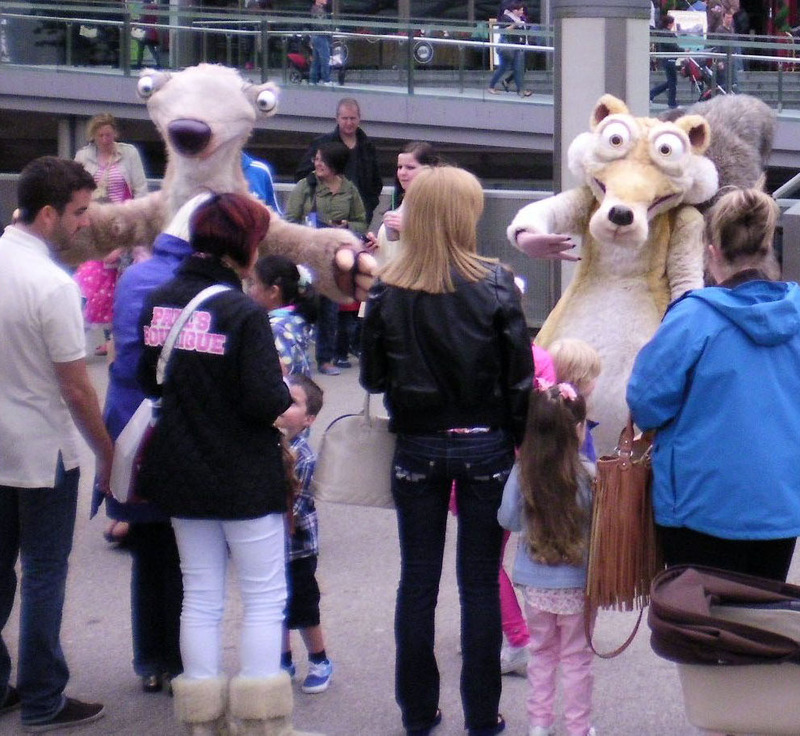 With our Scrat, Diego and Sid Ice Age costumes, any public event can be made that much more special. We make sure that anyone who arrives to an event in an Ice Age costume has been properly trained to interact with crowds in character at all times. We will also send a Road Manager or “minder” to accompany the characters at all time, ensuring each appearance goes smoothly and without any complications. Our characters are available for public events up and down the country, and can really give any family event that extra spark of fun. To find out more about how to book an official Sid, Diego or Scrat costume, contact us today. Sid, the ground sloth is one of the iconic characters in Ice Age. Abandoned by his family, Sid joins the herd on their journey. The herd find Sid annoying and clumsy at times, but recognise that he has a good heart. Sid has a big personality and is the entertainer of the herd. Scrat is a small sabre-toothed squirrel with a long bushy tail. Scrat is fascinated by acorns and will hunt them out no matter on the location. Scrat’s fearless nature and sheer determination to obtain acorns constantly puts him in danger. Whether it’s squeezing in between glaciers or causing an avalanche, Scrat never gives up and he finally obtains his prized acorn. Diego is a sabre-toothed tiger. Although he has large fangs and a sarcastic nature, deep down he is a gentle and kind cat. Diego was once a remorseless hunter but had a change of heart and lost interest. Diego became a loyal member of the herd and is seen as the protector. Five films have been released in the series: Ice Age in 2002, Ice Age: The Meltdown in 2006, Ice Age: Dawn of the Dinosaurs in 2009, Ice Age: Continental Drift in 2012 and Ice Age: Collision Course in 2016. The films are produced by Academy Award winning Blue Sky Studios. Ice Age is the #1 Fox Family Film Franchise of all time on Blu-Ray and DVD. 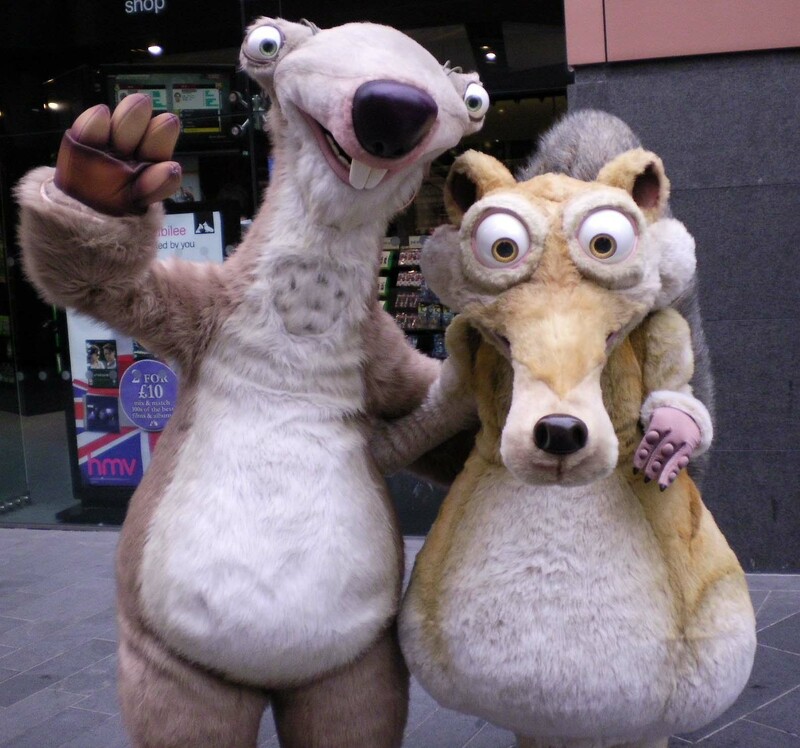 Mascot costumes Sid, Scrat and Diego are available to attend UK events.